FOR FULL INFORMATION view our online Vineyard Catalog. For pricing, or to discuss your needs, please call 800-237-4594. Sandvik, a leading producer of professional cutting tools, has developed a new generation of snips. 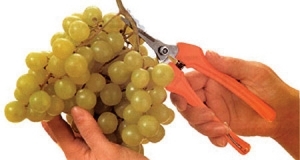 These snips have been extensively tested, and are designed for use by grape growers to thin vines and harvest the grapes. 1. Blade and cutting edge are designed to prune aggressively, but with less effort, and still provide a smooth, clean cut. 3. Rubber buffers cause less shock and reduce injuries to the elbow. 5. Handles made of aerospace aluminum are extremely strong and very light..
6. Three tool lengths available for reach and for personal preference. 7. Spare parts are available for all Sandvik professional pruning tools.